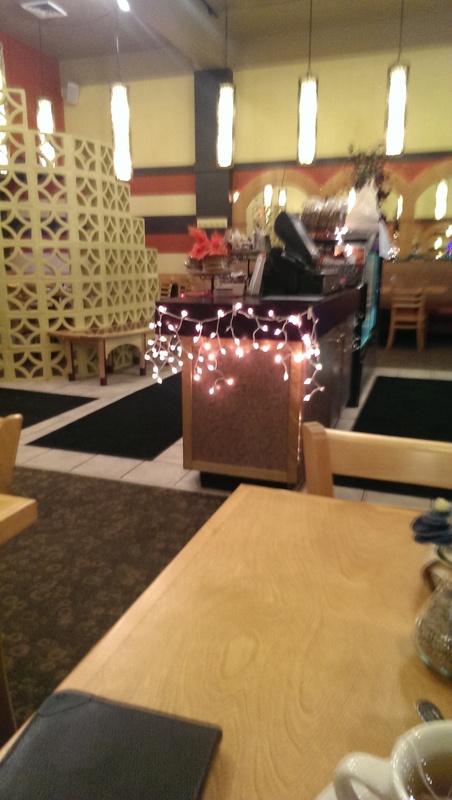 I have been a fan of Aladdin’s, a local Cleveland chain, for years now. Headquartered in Lakewood, the company also has locations in Indiana, Virginia, North Carolina, and Pennsylvania. It was founded in 1994. I first started eating there when I lived on the West Side (their Berea location), and now enjoy the local eateries on the East Side (Cleveland Heights as well as Hudson). 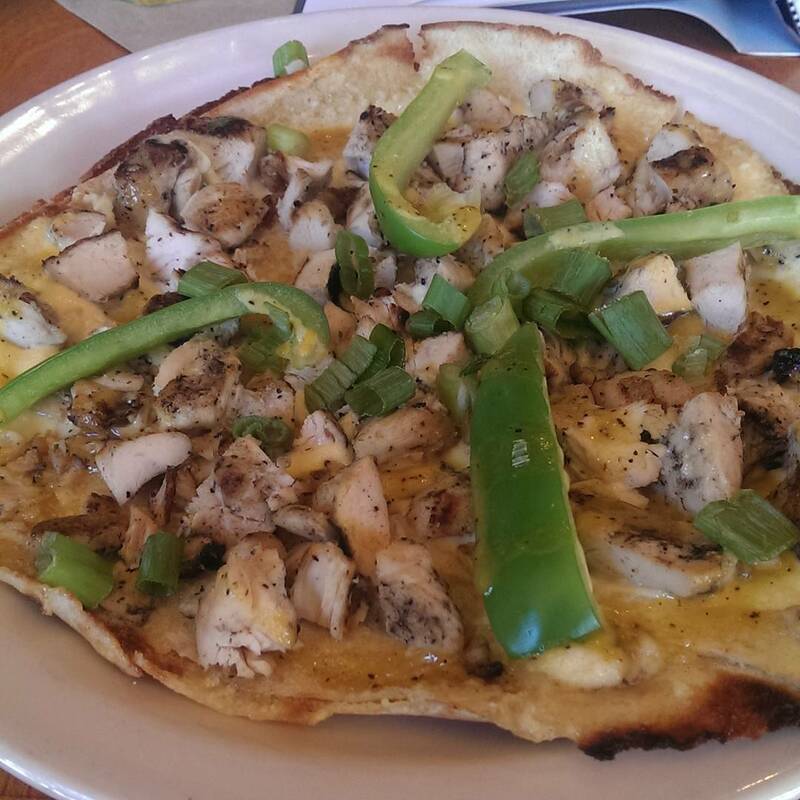 The food is solid and affordable, and the restaurant is very vegetarian-friendly. I am confident when I claim that Aladdin’s has the best hummus in Cleveland. Hands down. I am also extremely partial to their dawali (grape leaves stuffed with rice, chick peas, tomato, and parsley). The falafel also rocks. The vegetarian combo appetizer is a nice easy meal or easy to share. 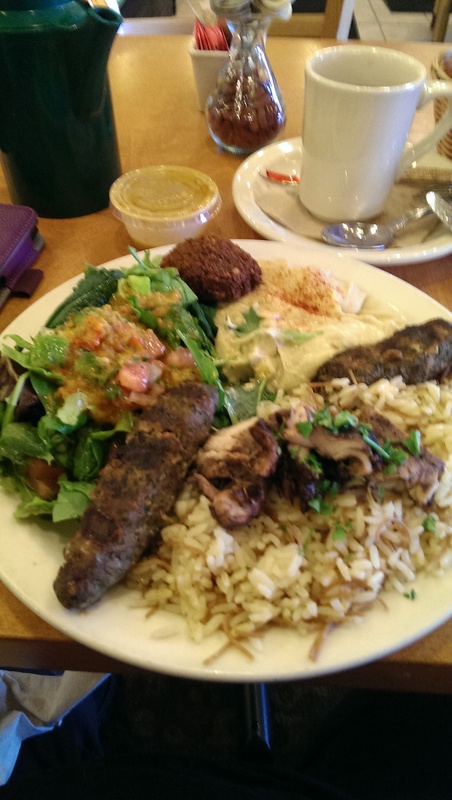 It features hummus, tabouli, baba, falafel, and dawali. My sister first turned me onto their V-9 soup, which is amazing. It features 9 different vegetables, including potatoes, carrots, onions, tomatoes, peas, zucchini, peppers, and celery (the ninth veggie might be squash, but I can’t remember off the top of my head). In any case, it is divine, and when I first tried it I was not a fan of vegetables. One taste and I was hooked and ordered my own bowl. 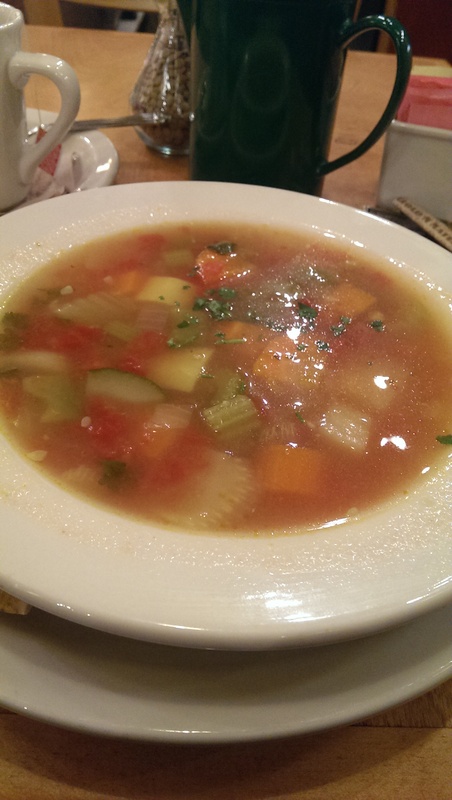 It is a great low calorie soup that warms the soul. Just look at the glisten on the broth and the fresh parsley floating on top. Yum. You can also add chicken to it for a heartier meal. The Flavor Savor Special offers a little bit of everything. It features grilled chicken mishwi and beef kafta on a bed of seasoned white rice with vermicelli, served with mixed greens, hummus and falafel. The beef kafta has a zesty flavor to it, while the chicken mishwi is scrumptious. The falafel was moist and delicious. Most of the time falafel is overcooked and dry. Not here. And I could eat a ton of their rice and vermicelli. Aladdin’s is known for their hot sauce. I ordered it without, but unfortunately my waiter served it to me anyway and I thought it was salad dressing. Yeah, it isn’t salad dressing, so I wasn’t able to enjoy my salad on my last visit. I also have a special place in my heart for their rolled pitas. Aladdin’s is known for its pita bread. Most everything is served with warm pita on the side. The rolled pitas are a nice pairing with the V-9 soup. 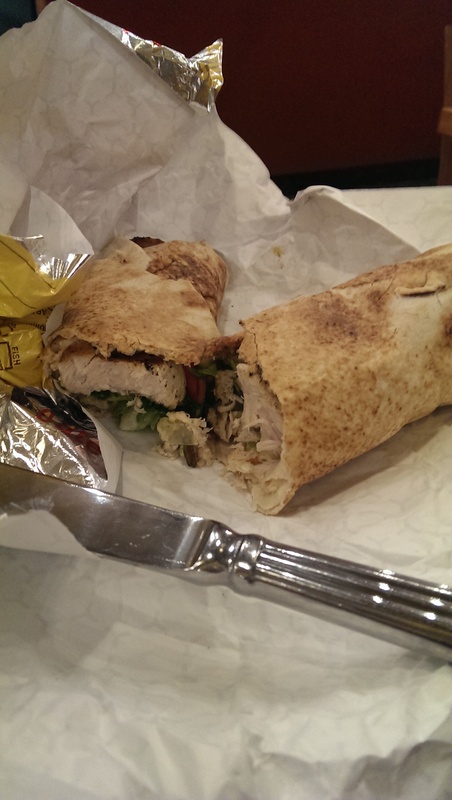 I love the chicken shawarma rolled pita (I was eating it before The Avengers made chicken shawarma cool! ), but recently tried the tuna steak rolled pita and fell in love. It features char-grilled tuna steak, greens, onion turnips, pickles, and curry spice topped with Aladdin’s garlic sauce (I quickly became addicted to this sauce!). The tuna was perfectly cooked and paired well with the turnips and pickles, which gave it a nice flavor over and above the curry-garlic sauce. I cut it in half here to show off the filling and to make it a little more manageable to eat. Aladdin’s is also known for their baked goods. The baklava is delicious, as are their carrot cake and Chocolate Bomb cake. They currently have a triple chocolate mousse cake that looks pretty amazing. All of their baked goods are made by Jasmine’s Bakery, which was established in 1997 to provide baked goods for Aladdin’s. I’m assuming it is a wink to the 1992 Disney classic, Aladdin, which makes me smile. It is also a good place to meet friends if you are juicing. Their fresh juices and smoothies are delicious.